Then write the Answer and Watch my Youtube video to study the model Answer structure & list of benchmarks for self-assessment of your answer. The English East India Company (EIC) was founded by a royal charter on 31/12/1600, to combat Dutch competition in Indian trade. 1750s: Robert Clive feared that Siraj ud-Daula's friendship with the French will harm East India company's trading privileges. It escalated into Battle of Plassey, Battle of Buxur and Treaty of Allahabad- which granted Diwani rights of Bengal, Bihar and Orissa to the EIC. 1810s: Company exported Gujarat cotton and Awadh cotton through Bombay port but Maratha presence in Deccan, created hinderance. So, military action / annexation became necessary. Company’s military officers always believed in vigorous display of sword to discourage internal and external enemies. They attached Burma and Nepal as ‘preemptive strike’ before those rulers encroached into Company’s Indian holdings. Annexed states provided cheap soldiers in abundance number for empire’s local and international wars such as the First World War. Anglo-French rivalry: The British feared Napoleon sending help to Tipu. 4th Anglo- Mysore war became inevitable. 1840s: The EIC wanted Punjab to serve as buffer state against Afghan-invaders. Bentick signed Indus Navigation Treaty with Ranjit Singh. But after the death of Ranjit Singh, there was political instability in Punjab, so it annexed. 1850s: Britain feared Russian expansion after the Crimean war. So, the British tried to capture Afghanistan to secure North-West frontier. Company’s commercial profit were insufficient for its military campaigns. The British believed in Mercantilism, so they’d not send “GOLD” from their homeland for military campaigns or to pay for the imports or even for building Railways for transporting commodities. 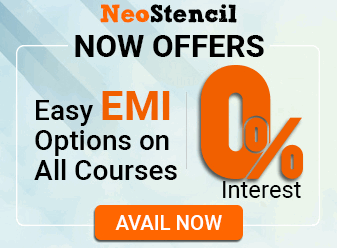 All the financial resources had to be mobilized from within India. Therefore, company had to start collecting land-revenue from peasants. 1765: Treaty of Allahabad granted the Company the diwani (revenue collecting rights) of Bengal, Bihar and Orissa. To maximize their revenue collection, the Company official came up with three types of revenue settlement systems. The deficiencies & misuse of these systems led to land evictions, tribal displacement, and armed rebellions such as the Santhal Uprising. So, again the Company faced military exigency. EIC officials wanted stable frontiers for smooth trade & commerce. It motivated them for military campaigns. But such campaigns were expensive, therefore company needed to secure revenue rights by annexing Indian states. 0: if finished the conclusion in a single simple line- “…thus India was enslaved by the British”. Since it’s 250 words answer, you’ve to write a good conclusion and mention the keywords from the question in it. Not more than 2 marks if you’ve not mentioned any keywords such as Tipu, Afghan, Maratha, Governors, treaties and wars. 0: if linear narration of events given without separating and linking the three exigencies viz. 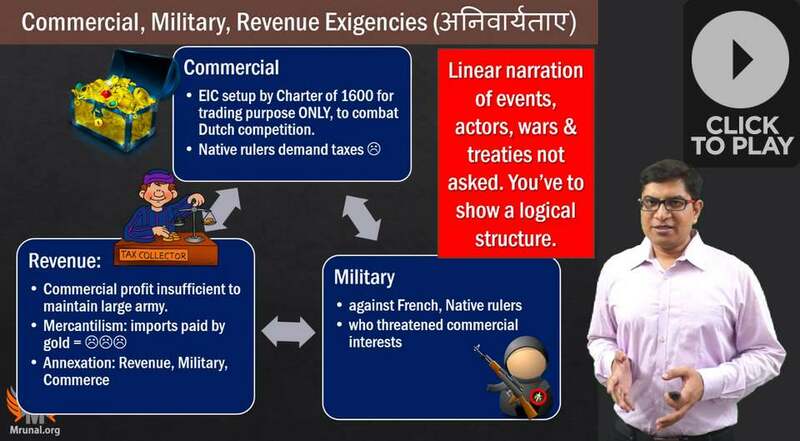 military, revenue and commerce. (-1) if appearing in vernacular medium, and yet used English terms such as “रेवन्यू, मिलिट्री, कोमर्स”, instead of writing their proper translations. Don’t give yourself more than 4 marks: if no efforts made in introduction and conclusion, most of the body space devoted to “Commerce and industrialisation”, answer is devoid of any factual details- just doing emotional outrage over how Britishers enslaved India. Give yourself upto 8 marks: if proper introduction and conclusion, diagram, each exigency written as sub-heading, atleast one factoid given under commerce, revenue and military exigency. Great guidance sir, please make a similar article on essay writing before mains exam sir. Great article, please make a similar article on how to write an essay before mains sir. It would be of great help.